A couple of weeks ago, I learned how to grow mushrooms four different ways! I had signed up for a mushroom cultivation workshop, which took place in the parking lot in the back of the Homesteader's Emporium on October 6th. I was very excited to learn about growing my own mushrooms! 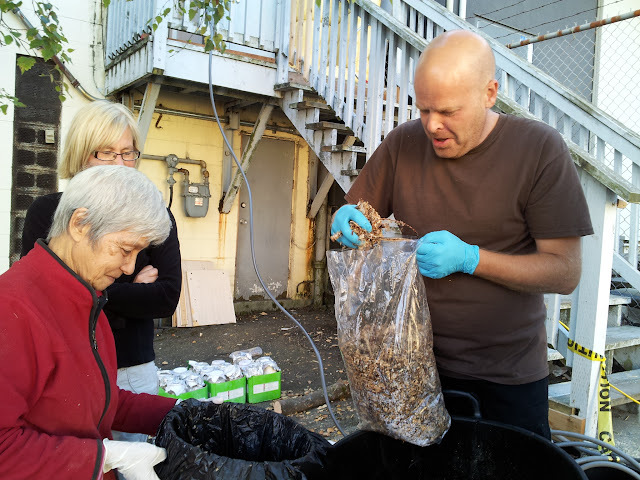 Our instructor, Vancouver's own Mushroom Man, Scott Henderson. All the equipment we used. 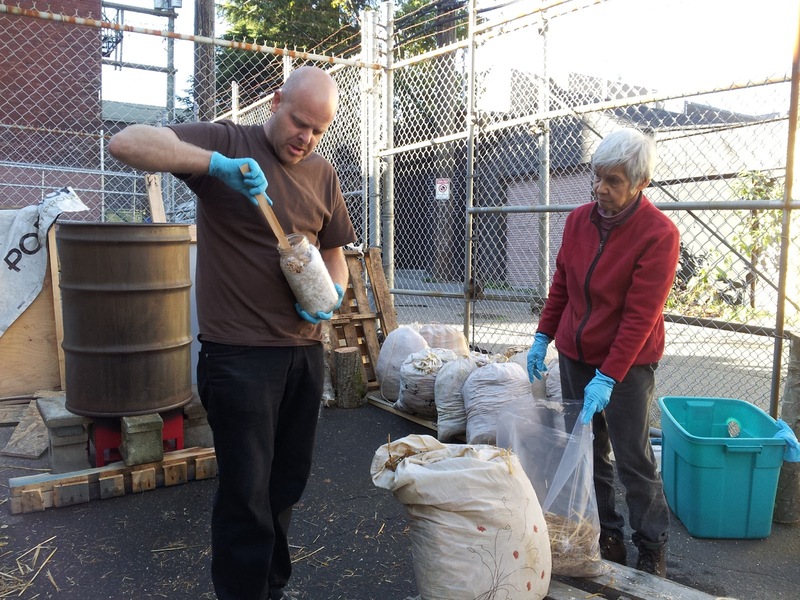 One of the projects was to inoculate logs with Shiitake mushroom mycelium. 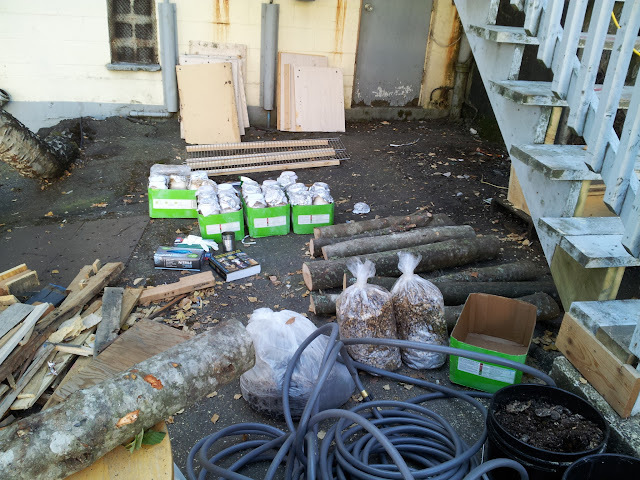 A nice workshop attendee brought enough logs for all of us to use from her Bowen Island farm! Most came from Alder trees but she also had a few Maple logs as well. Shiitake mushrooms like to grow on hard wood. 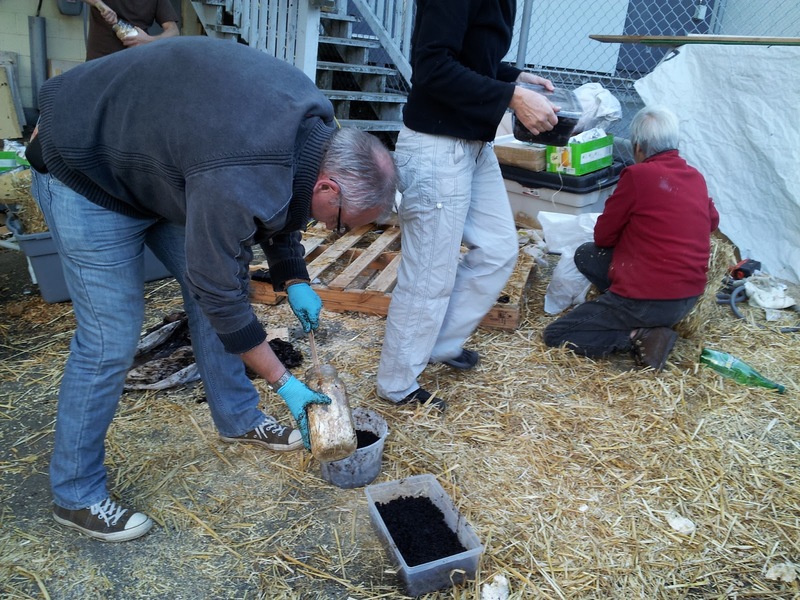 First we drilled some holes in the log, popped in wooden dowels that were inoculated with Shiitake mycelium then painted over the hole with hot wax. Hopefully they grow! But it'll take 12 months or more before I'll be able to see anything! In the meantime, I'll have to keep the logs in a shaded area and keep it moist. I made 3 Shiitake logs, two Alder and one Maple. Crossing my fingers that at least one of them will provide me with some mushrooms! If they are successful, they will provide me with Shiitake mushrooms for 3-5 years! Our second project involved growing Oyster mushrooms in bags of straw. In the beginning of the class, we stuffed pillow cases full of straw, threw them in a barrel of hot water and let them sit there for an hour. This was to sterilize the straw. After letting the pillowcases full of straw cool for a half hour, we transferred the straw into a clear plastic bag, layering straw and Oyster mushroom spawn in a lasagne-like fashion. We used one jar of Oyster mushroom spawn growing in wheat millets each. Two lucky attendees also got a pink strain of Oysters! 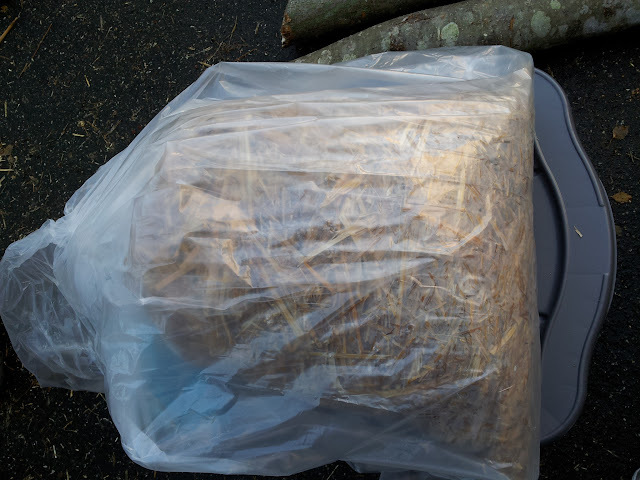 We tied off the bag of straw and Oyster spawn, poked lots of holes in the sides (for air and the mushrooms to grow out of) and bagged it in another bag, to keep in moisture. I'm most excited about this. I can't wait to have fresh Oyster mushrooms for dinner! Next was growing mushrooms in wood chips. The type of mushroom we are going to grow is King Stropharia, which likes to grow outdoors, under shade, they also like to grow in hard wood chips but a mix is fine. I've never actually eaten one of these mushrooms so I'm pretty excited to be able to cultivate these in my own backyard! We each brought a big container (20 gal) to bring our wood chip spawn home. 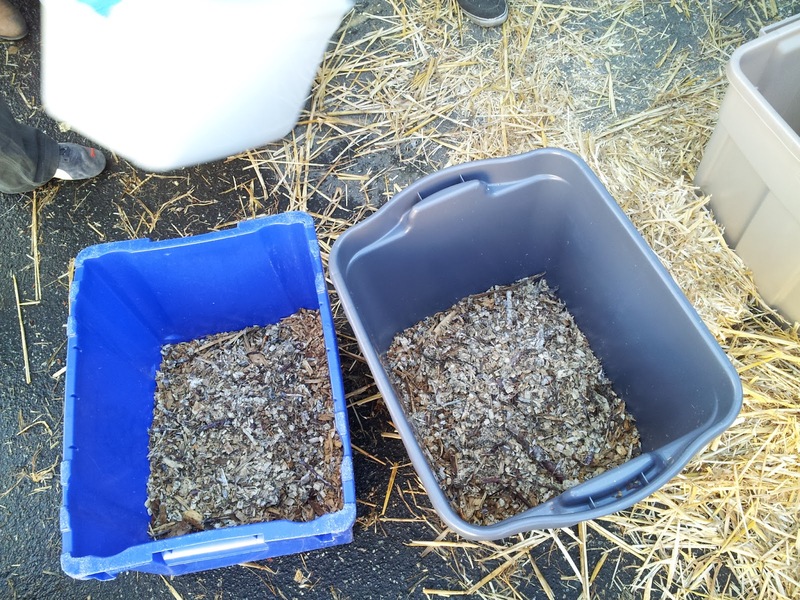 We would keep these indoors, adding fresh wood chips once in a while just so they can get started growing before transferring them to a wood chip bed outside in the spring. Lastly, our experimental project is growing Oysters in coffee grounds. Scott went to visit a Starbucks and asked for their used coffee grounds and they gave him a big bagful. He said it is best to use it right away when it is hot to prevent contamination. But he doesn't guarantee anything! Here's my Oysters growing in a shoebox in coffee grounds. I think I will have to transfer it in a taller container or bag since Oysters like to grow upright from the sides. If you want to learn about growing mushrooms or getting your own cultures, you can contact Scott on his website http://www.shroomstore.ca. He probably will hold some more workshops in the future! The Homesteader's Emporium also holds other interesting workshops at their store. Check out their website at http://homesteadersemporium.ca! An inspiring article on mushroom growing with visuals too !